This 46-carat white diamond comes from Firestone Diamonds’ Liqhobong Mine in Lesotho, Southern Africa. The stone, which was recovered without damage, will be sold at the company’s next tender at the end of this month. 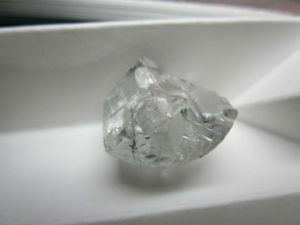 “The recovery of the white 46-carat stone is good news as we start mining across the pit toward the northern side of the ore body over the coming months,” said Paul Bosma, CEO of Firestone. The announcement comes in tandem with a reported stabilization in price for smaller, lower-quality diamonds. Firestone, like several other producers, is reporting price improvements for such stones, as observed at its most recent sale in early December. “We look forward to further improvement as we head into the new year on the back of an expected positive diamond jewellery retail season,” said Bosma.